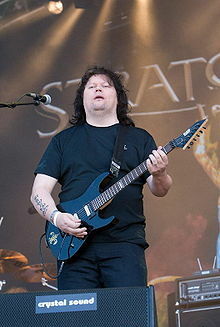 Timo Tapio Tolkki (born 3 March 1966) is a Finnish musician best known as the former guitarist, songwriter and producer of the power metal band Stratovarius. With his tenure lasting for more than twenty years, he was the longest standing member of the band before his departure in 2008. After leaving Stratovarius he formed two supergroups named Revolution Renaissance and Symfonia, both of which have since disbanded. In a 2011 article by Guitar World magazine, Tolkki was included in the all-time top 50 list of the world's fastest guitarists. Tolkki started playing guitar at the age of seven and practiced intensely, sometimes eight hours a day. When he was twelve years old, his father committed suicide by jumping from the fourth floor of his apartment. Before joining Stratovarius in 1984, Tolkki had played with the bands Antidote, Thunder and Road Block. At the beginning of his career with Stratovarius, he served as vocalist as well as handling all lead and rhythm guitars, and at times bass guitar (until Jari Kainulainen's arrival in 1993). After the band's third album, Dreamspace (1994), Tolkki handed over vocal duties to Timo Kotipelto, who took over from Fourth Dimension (1995) onwards. This was largely due to Tolkki's desire to evolve the overall musical direction of the band and concentrate on his guitar work. Further changes were made after Dreamspace, including the departure of the remaining original members of the band, keyboardist Antti Ikonen and drummer Tuomo Lassila, due to creative differences. In 1994, Tolkki released his first solo album, Classical Variations and Themes, which had at the time been one of his longtime ambitions. The album was similar to his work with Stratovarius, but with more focus on primarily instrumental compositions. His second solo album, Hymn to Life (2002) showed a more personal side, dealing with such emotional issues as his relationship with God and his late father. He was diagnosed with bipolar disorder in 2004, following a nervous breakdown which occurred some months after Stratovarius acrimoniously disbanded. After a period of rehabilitation, he went on to make a full recovery later that year and subsequently opened his own recording studio named Goldenworks. A final self-titled album with Stratovarius was released in 2005, after which he announced his departure from the band in 2008. Upon leaving he decided to waive the legal rights to the name. He later claimed this was done as a protest due to the remaining members deciding to continue the band as Stratovarius. Tolkki's next project was an album described as a rock opera, named Saana – Warrior of Light Pt 1. Released on 14 March 2008, it featured a number of guest vocalists, including soprano Jennifer Sowle in the lead role, as well as Heikki Pöyhiä of Twilightning. Also in 2008, he founded a band called Revolution Renaissance, which released three albums between 2008 and 2010. In 2010, Symfonia was formed as a power metal supergroup comprising Tolkki, singer André Matos, keyboardist Mikko Härkin, drummer Uli Kusch and former Stratovarius bandmate Jari Kainulainen. They made their debut performance at the 2011 Finnish Metal Expo and later released their only studio album, In Paradisum, but in December of that year Tolkki announced the discontinuation of the band, and subsequently his retirement from the music industry. In March 2012, Tolkki stated on his Facebook profile (and official Symfonia page) that although he had left the music business, he hadn't given up on music altogether: "With all the tools available for us today to release music, you will hear something interesting from me". Later he released a mock album cover entitled Classical Variations and Themes Vol 2, suggesting a new solo album. On 10 April 2012 he released a new instrumental track named "Dinner with Paganini", which was made available as a free download through PledgeMusic, as well as a revised name for a potential new album, Classical Variations and Themes II: Credo. However, on 26 July, he announced the cancellation of the project. On 8 January 2013, Tolkki announced the opening of a new mixing and mastering studio named Studiotolkki, located in Helsinki, Finland. In February 2013, Timo announced his new project, Avalon, featuring a group of guest musicians such as Michael Kiske (Unisonic, Helloween), Sharon den Adel (Within Temptation), Elize Ryd (Amaranthe), Russell Allen (Symphony X, Adrenaline Mob, Star One), Rob Rock (Impellitteri, M.A.R.S. ), Tony Kakko (Sonata Arctica), Jens Johansson (Stratovarius, Yngwie Malmsteen), Derek Sherinian (Dream Theater) and Alex Holzwarth (Rhapsody of Fire). The album, released on 17 May 2013, follows a story set in a post-apocalyptic future. In 2055, Earth has been almost destroyed by natural catastrophes, and a small group of survivors decide to set off a journey to find a sacred place known as The Land of New Hope. On 24 July 2013, Tolkki announced via his Facebook page (among a statement regarding Stratovarius) that he would be the producer, mixer and songwriter for a new album of the duo Allen/Lande, composed of Symphony X vocalist Russell Allen and Norwegian singer Jørn Lande. The album The Great Divide was released on 17 October in Europe and 21 October 2014 in North America. In May 2015, it was announced that Timo would produce and perform in a project with Chilean singer Caterina Nix titled Chaos Magic. Caterina and Timo met in Chile when Stratovarius was performing there. She would later guest sing in Avalon's second album, Angels of the Apocalypse. Their first, self-titled album is set for a 3 July release in Europe. In June 2015 they released their first videos: a video for the song "I'm Alive", and two lyric videos for "One Drop of Blood" and "A Little Too Late". From the period spanning Stratovarius' first three albums, Tolkki's guitar playing was more progressive and heavy. During this time he preferred E♭ tuning, with his compositions often bearing a dark and unnerving tonal quality (particularly on Dreamspace). Following Timo Kotipelto's arrival as lead singer, Tolkki's style shifted gradually more towards the traditionally speedy and melodic format of power metal, with an emphasis on such elements as neoclassical phrasing and various shredding techniques. Throughout his career, Tolkki has played ESP Guitars. His primary model is a customised M Series, most notably in solid black and another with the artwork of Visions (1997) on the body. In some Stratovarius music videos, he is seen playing an EX series. Mesa/Boogie and Laney was his amplification of choice until 2001, after which he switched to using Marshall. Since 2007 he has used an ENGL Powerball. ^ Guitar World Staff (2011-09-17). "50 Fastest Guitarists of All Time". Guitar World. NewBay Media. Retrieved 2012-07-31. ^ "Timo Tolkki". MySpace. Retrieved 2012-07-31. ^ Tolkki, Timo (2010). Loneliness of a Thousand Years. Finland. p. 4. Retrieved 2012-07-31. ^ "History". stratovarius.com. Retrieved 2012-07-31. ^ Tolkki, Timo (2013-07-24). "I want to thank everyone who answered to my simple...". Facebook. Retrieved 2013-11-05. ^ "Former Stratovarius, Helloween, Andra Members Join Forces In Symfonia". Blabbermouth. 2010-11-08. Retrieved 2012-07-31. ^ Tolkki, Timo (2012-01-13). Guitarist Tolkki - "About My Retirement From Music Business" Archived 5 June 2012 at the Wayback Machine. Metal From Finland. Retrieved 2012-07-31. ^ "Wall Photos". Facebook. Retrieved 2012-07-31. ^ "Timo Tolkki - Dinner with Paganini". PledgeMusic. Retrieved 2012-07-31. ^ Tolkki, Timo (2012-07-26). "Canceling the pledge campaign". PledgeMusic. Retrieved 2012-07-31. ^ "Former Stratovarius Mainman Timo Tolkki Opens Mixing And Mastering Studio". Blabbermouth. 2013-01-08. Retrieved 2013-01-09. ^ a b "THE LAND OF NEW HOPE - The new Metal Opera". Frontiers Records. 26 February 2013. Retrieved 26 February 2013. ^ "Allen Lande new album". Blabbermouth. Retrieved 21 September 2014. ^ "TIMO TOLKKI Creates CHAOS MAGIC With Chilean Singer CATERINA NIX". Blabbermouth.net. 11 May 2015. Retrieved 11 May 2015. ^ "Chaos Magic Feat. Ex-Stratovarius Guitarist Timo Tolkki Chilean Singer Caterina Nix: 'I'm Alive' Video". Blabbermouth.net. 12 June 2015. Retrieved 12 June 2015. ^ "Chaos Magic Feat. Ex-Stratovarius Guitarist Timo Tolkki Chilean Singer Caterina Nix: 'One Drop Of Blood' Song Streaming". Blabbermout.net. 17 June 2015. Retrieved 23 June 2015. ^ "Chaos Magic feat. ex-Stratovarius guitarist Timo Tolkki, chilean singer Caterina Nix: 'a little too late' song streaming". Blabbermouth.net. 23 June 2015. Retrieved 23 June 2015.